As you probably all know, Glossier recently launched in the UK and it was a very exciting day for bloggers and beauty lovers alike! I’ve been living in Canada for a few months now, so I was lucky enough to try Glossier out a little early, but I wanted to place another order after the brand launched in the UK so I could try out some newbies and share some of my thoughts. Although you can purchase all items separately, the Glossier website does group some of their products together and create bundle offers that help you save money if you’re wanting to try practically everything (of course, that’s really helpful for skincare addicts like me). The first bundle I chose was The Mask Duo which includes two full size face masks which you can use alone or together as part of your skincare routine. The first mask is the Mega Greens Galaxy Pack, described as a juice cleanse for your face. It’s a clay based mask which helps draw out any impurities while also nourishing your skin with a lot of leafy green nutrients and antioxidants. I’ve found that this is perfect to use in the evening when my skin is feeling a little clogged up and needs a refresh. The duo also comes with a full size tub of the Moisturizing Moon Mask, which helps to hydrate and brighten the skin. It’s a creamier formula which is very cooling when applied to the face, especially after the galaxy pack. I find it helps soothe the redness on my cheeks and boosts my overall complexion. If applied lightly, you can leave this overnight to quench thirsty skin and then wash off in the morning. My skin definitely feels plumper and very well nourished after using this mask combination together! The tubs are also very decently sized (90ml), which means you get plenty of applications per mask. The second bundle I chose was The Super Pack. I’ve been eyeing up the Glossier serums forever because the packaging was just so adorable, but I couldn’t justify the price tag because each bottle is only 15ml. However, after seeing them everywhere on Instagram, I caved and bought all three – although I did save a little so with the bundle deal so I guess that’s good. My favourite serum from the lot is probably Super Bounce because it’s incredibly hydrating and feels thicker than the others. It has more of a jelly like texture which feels like it’s adding plumpness and softness to the skin, just like the name suggests. The pack also includes Super Glow, which is a lot more runny in texture. It is meant to brighten the appearance of my complexion and give an overall vitamin enriched boost. I haven’t used this enough to notice a huge difference, but I definitely want to keep at it and give this one a real shot. Super Pure is the last of the three that come in this set, and it’s a lovely one as well. It definitely eases all the redness on my face after a good cleanse, and calms any blemishes that might have appeared. I think this is definitely worth a try if you’re prone to acne. 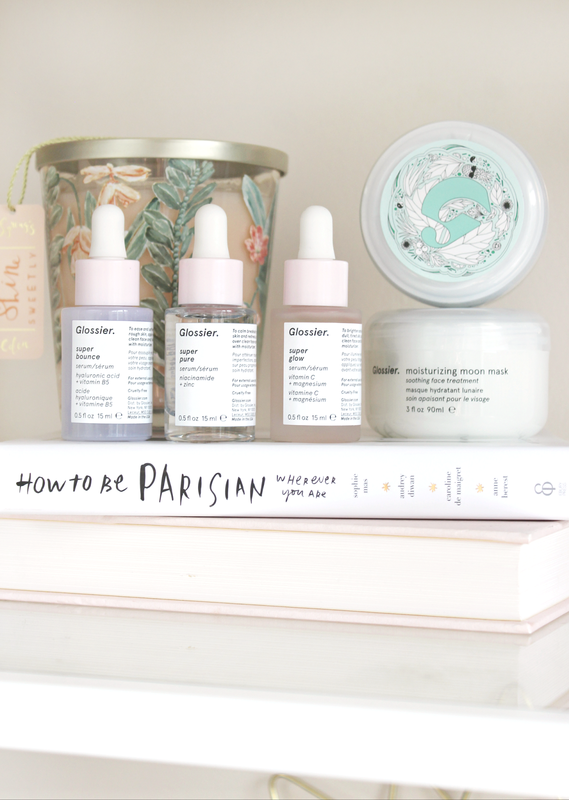 Once I’ve applied one or two of the serums, I like to follow up with the Glossier Priming Moisturizer and watch it sink right in – it’s amazing how the products work so well together! Glossier is definitely a brand with a lot of hype around it, and although I can’t speak for everyone in saying whether it’s worth it or not, I can say that I’m in love with everything I’ve tried so far and I can’t wait to try more. Previous Post Two Lush Hair Essentials.